Mold Infrared - Moisture Is Your Attic Properly Insulated? Find Out! Last week, during a typical home inspection, I opened the attic access hatch in a client’s garage. At that moment, an avalanche of heat poured over me. Before I thought about crawling in, I shot my handy-dandy laser temperature gun in to check the temperature. With my client looking over my shoulder, we both saw the readout at 141 degrees! Keeping your home cool in the hot, humid south requires a great deal of air conditioning energy. 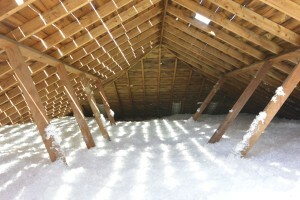 The task is more challenging for homes with poorly vented and/or under-insulated attics. Ideally, the air in your attic would be the same temperature of the ambient outside air, but in the summer, that is never the case. As the sun beats down on your roof, the roofing materials rapidly heat. Roof shingles easily exceed 140 degrees. That same heat energy radiates and conducts into your attic, heating all the materials within it, then passes from your attic into your home. It is important to have a well vented attic to allow the heat to escape. Some homes have a powered attic ventilator (PAV) to facilitate heat escape, but they are not recommended; they may consume more energy than they save, and they can actually draw cool air out of your home’s living space. The best solution to help keep your home comfortable is to ensure your attic has an appropriate insulation barrier to reduce the rate at which heat enters your home in the summer, and leaves your home in the winter. Fiberglass and cellulose are the most common forms of attic insulation because they are effective and economical insulators against conductive heat. Additionally, installing a radiant heat shield in your attic will reduce the amount of radiant energy that enters your home. A heat shield is a special foil-faced paper simply stapled across the trusses in your attic. The means used to rate insulation quality is called an “R-value”. It is mathematically defined as energy flow rate (BTUs per hour) per square foot, relative to the temperature differential (dT) across a specific material. In short, a higher R-value means less heat is able to transfer through a material in a given period of time. R-value relates only to a material’s ability to resist conductive heat, not radiant heat. Also, R-values are not linear, meaning that the R-value for 10 inches of fiberglass is NOT equal to ten times the material’s R-value for 1 inch of thickness. In fact, it is a federal offense for insulation contractors to market and sell insulation based only on the thickness of insulation. Insulation must be offered and installed based on the R-value it will provide once installed. In Florida, attics should have insulation with an R-value of 30 or more, which can be achieved with about ten inches of fiberglass or cellulose insulation. For new homes, homebuilders are required to provide buyers with specific insulation information including the type, thickness, and R-value of the insulation installed in each part of a house. If you feel your attic is not properly insulated, call a licensed insulation contractor for an evaluation and be sure to get quotes from at least two contractors. Be sure to avoid insulation work, or any work for that matter, in attics over 120 degrees. At that temperature a person can loose consciousness in several minutes. With skyrocketing energy prices, adding insulation to your home is a great investment and will keep your family happy all year round.